HONDIUS - Castillae veteris et novae descrition. HONDIUS, J. - Castillae veteris et novae descrition. Castillae veteris et novae descrition. - HONDIUS, J. Title : Castillae veteris et novae descrition.. Size : 14.1 x 19.5 inches. / 35.9 x 49.5 cm. 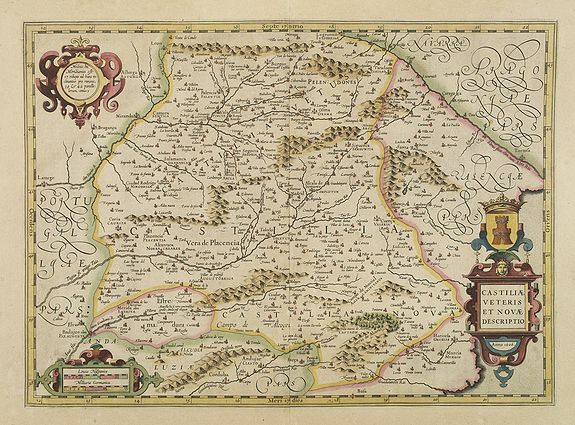 Description :Jodocus Hondius map of Castille, showing Zaragoza, Valencia, Alicante, Cartagena, Madrid, Cordoba, Sevilla, Salamanca, Palencia, Segovia, Toledo, Cuenca, Granada, etc. Condition : A good and strong impression. In very good condition. Paper slightly age-tned. Cartouche hightened with gold dots.